Winters in Oregon are wet and cold for biking. Running is warmer, so we soggy joggers can only dream about the days ahead of summer and cycling. Each rainy run with my Dad is a trial, not usually for time but for any debatable topic—the most recent of which was his bike. My dear old Dad needs a new bike. 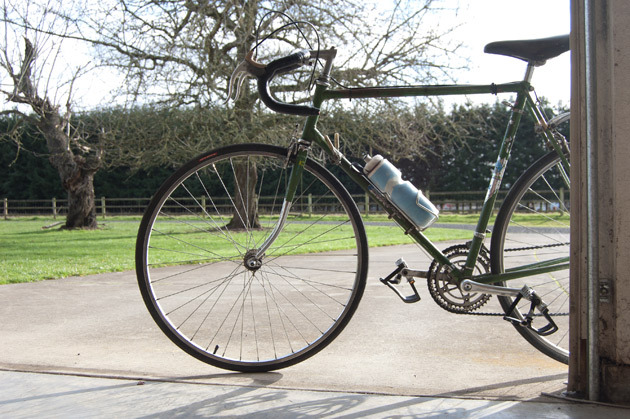 He rides a green 1972 steel Gitane Interclub—that he has affectionately named 'Kermit'—and its best days are definitely behind it. But he won't give it up. As we run, he has an hour to vindicate his vintage taste; I have until the seven miles are finished to try and shoot down his insanity. Me: Dad, what do you say to a new bike for Christmas? Dad: What do I need one for? I have Kermit. Me: Kermit weighs more than my bike—with me on it. Steel is way too bulky. Dad: Bulky? I prefer the term 'beefy.' Kermit's lasted me this long. His bike is long-lasting all right. But I point out that he'd go so much faster with a lighter frame. He scoffs at my aluminum, saying it can't even get picked up by the intersection sensors. Me: You'll get picked off by the peloton. Dad: Would I rather take off eight minutes or eight pounds? I'm out there to get a workout after all. Me: It needs new shifters—the old friction ones are too far down. After all, you're the one always quoting that American suffragist about not wasting life in friction when that could be turned into momentum. I feel my momentum and go on before he can say anything. Me: It needs a new seat. It's like a rock sitting atop the seatpost. There's no quick release, and you always have to find a half-inch wrench and WD-40 to adjust it. And, you could attach a pump to a new bike's frame instead of riding around with it stuffed in your shorts. Dad: I guess it just doesn't bug me. Me: And the electrical tape on the bars? Dad: Nice touch, isn't it? That's it. I'm getting tired, so I throw in my trump card: I go after his tires. Me: No one uses Schrader valves anymore. I don't even know where you could find a solely Schrader pump these days. Dad: At any gas station anytime I've got a flat—that's where. Oh, how the Old Man rallies. The run is almost done, and he explains to me that there is an old bicycle graveyard shop down in Portland where he can pick up any parts he needs. Me: But why? Why spend money to buy all these old parts when you could get a brand-new bike that rides like a dream? Dad: Kermit's stuck with me and I'll stick with him. I don't want a new bike because I love the bike I have. I know he's a bit rusty, but then, so am I. Me: You say you care about it and yet you don't even lock it up. Dad: Why should I? No one's going to steal it. Me: Because no one can carry it. Dad: Exactly—call it theft prevention. We're almost back to the car, and Dad picks up the pace. Racing and rhetoric have once again carried the day. And then it dawns on me. The reason my Dad never bought a new bike for himself is because he bought them for me and my brothers. The reason he doesn't have time to fix it up is because he works hard, and any time he has off is spent riding with us. I'm left breathless, less from the run than from the realization of the loyalty of a rider to his bike—not to mention the love of a father for his kids. Keeping Kermit was originally published in the Spring 2012 Issue of Paved. Download the entire issue here.